Nika was born in Chicago and completed her first degree in biology from Northern Arizona University along with a minor in Russian. 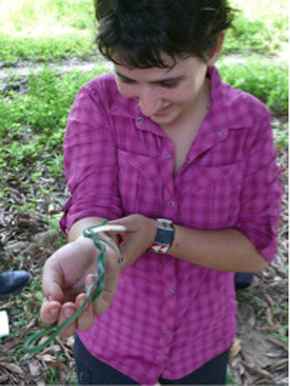 A desire to travel across the world led her to do a study abroad program in Australia at James Cook University where she had her first taste of conservation science. Nika knew from the age of sixteen that saving endangered species was her life goal, but has spent the last several years trying to figure out how to accomplish such an endeavour. After graduating and a brief quarter-life crisis, she decided to address another passion in her life: writing. Nika ended up in England completing a Masters in Writing from the University of Warwick. Then the travel bug hit again and she fled to Italy for a month to volunteer for a wine vineyard through the non-profit organization WWOOF. After some hard work in the sun and copious glasses of organic wine, Nika moved to Tanzania to gain first-hand experience in the conservation field. Although she did biology field work in various parts of the US, working for an NGO abroad proved to be an unprecedented challenge. For six months she planned conservation research and community outreach projects on a small island called Mafia. The hard truth of the difficulties behind project planning became clear almost from the start of her journey and has led Nika to where she is today, pursuing a Masters in Conservation Science through Imperial College London. Nika hopes that achieving degrees at the postgraduate level in both the arts and sciences will give her more knowledge and experience needed to make a hard dent in conservation. Despite getting back into science, she hasn’t forgotten her passion to write and firmly believes in the importance of communication. Nika has joined Mongabay.com to be part of the fight to spread the word and to connect people with their environment.